It’s tough to beat this deal coming from Toronto, Canada. 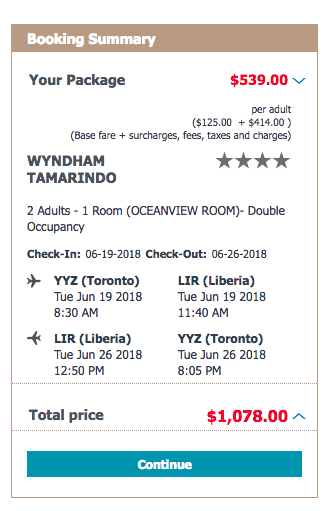 The price for the flight alone is worth it, $415 or $539 CAD. Plus, this package includes 7 nights at the Tamarindo Wyndham! The Wyndham Tamarindo is not an all inclusive, but this deal comes with a free buffet breakfast and access to the Beach Club. Plus, it’s a direct flight. It also looks like this package is only available for the June 19 through June 26 dates.